July 4 is a great day for a barbecue. And today is National Barbecued Spareribs Day, that all Americans across country celebrate. Spareribs come from the belly side of pig's rib cage. They are longer, flatter and heavier, than baby back ribs. They have more bone, than meat, however, the large amount of fat makes spareribs more tender than baby back ribs. By the way, fat makes spareribs less expensive than baby back ribs, but it enriches the flavor. The term spareribs may relate to the spare amount of meat on them. However, spareribs are very popular for barbecue. They are sold smoked that makes them perfect to grill. Serve barbecued spareribs with sauce and enjoy your meal. If you want to make spareribs taste even better, use a dry rub or sauce (and even both) before you start grilling them. Trim the membrane, that is called silverskin, before you rub the ribs. 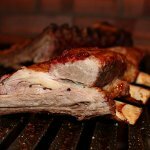 Try to cook spareribs as long as possible, because they will only benefit from a long cooking time at a low temperature.